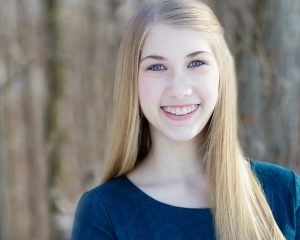 Hannah Kulawiak, 15, is an Aurora High School freshman who hopes to pursue a college degree in musical theatre and work towards a career on Broadway. Hannah has been involved in theatre since she was 6 years old. At 7 she began singing in the children’s choir at her parish, The Church of the Holy Angels in Chagrin Falls, where she is now a frequent cantor. Hannah recently attended a 3-day intensive at the prestigious Broadway Artists Alliance in New York City where she learned from industry professionals such as Michael Cerveris, Lesli Margherita, Bob Cline, Alexander Gemignani and Tally Sessions. Hannah’s latest role was Eileen Evergreen in the Gershwin musical Nice Work If You Can Get It at AHS. Last fall she played Wednesday Addams in The Addams Family at Geauga Lyric Theater Guild. Favorite roles include Laurey in Oklahoma! and Alexi Darling/Seasons of Love soloist in RENT: School Edition (Hathaway Brown Theatre Institute), Margot in Legally Blonde (Mercury Theatre Company’s TeenStock) and Teen Fiona (Beachwood Community Theatre). Other roles she has enjoyed include Belle in Beauty and the Beast, Jr., Ursula in The Little Mermaid, Jr., Miss Hannigan in Annie, Jr., Mrs. Paroo in The Music Man, Jr. and Cat in Honk, Jr. This summer Hannah will play Cinderella in Into The Woods at Hathaway Brown Theatre Institute. In addition to having a passion for musical theatre, Hannah is an avid violinist. She is Concertmistress of her Freshman class orchestra and a three-time winner of her school strings competition. A career straight-A student, Hannah was recognized last year with the Principal’s Award for top 8th grade female student and was also the recipient of The Sons of the American Revolution Citizenship Award, voted upon by her peers.